toon|Sound Level Analyzer Support - toon,llc. "Sound Level Analyzer" is sound level meter and sound analysis tools for iPhone. "Sound Level Analyzer" has additional analysis modes, which are time graph, frequency realtime analyzer (RTA) and FFT analyzer. It can be used to analyze the characteristics for the sound/noise source. In addition, the high-end app "Sound Level Analyzer PRO" has more powerful sound / noise analysis function in addition to the sound level measurement function, so please consider using these apps for your advanced requirements. Please to click the following link to download "Sound Level Analyzer" from App StoreTM. It will be open the download page on App StoreTM. - Spectrum analyzer function : FFT analysis, 1/3-octave band response analysis. Snapshot : Save measurement display with time stamp to Photos. 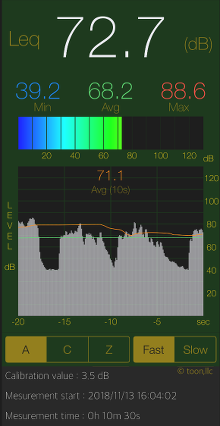 "Sound Level Analyzer" has two types of measurement analysis modes. By tapping on each mode button, you can select one of the modes and display it. The function of each mode is as follows. "MAIN (Leq) mode" and "P.S mode" are also switched during measurement operation. In addition, it will start up in MAIN (Leq) mode at the first boot-up. "MAIN (Leq) mode" makes the sound level measurement in general. In this case, by applying the appropriate Frequency Correction, Time Correction, and Level Correction, you can be the best sound level measurement. Sound level measurements are displayed measured values​of Equivalent continuous sound level (Leq), minimum value (Lmin), maximum value (Lmax) and Time average equivalent noise level (Lavg) in dB units. The Leq is also displayed as a bar graph. "P.S mode" displays frequency spectrum analysis in real time. Measurement is displayed by 1/3 octave band response and FFT analysis. The 1/3 octave band analysis displays the signal response of the input signal's frequency spectrum in 1/3 octave and 24 band (100 Hz to 20 kHz). FFT analysis displays the FFT spectrum by Fast Fourier transform. You can also switch the frequency range and display it. By tapping "Display Max" button, it can display the frequency spectrum characteristics at the time of maximum equivalent noise level (Lmax). In addition, by tapping "Value" button, it can display the measured values for each band of 1/3 octave band analysis in real-time. If you tap "Snap" button, you can capture the measured image to Photos. It is possible in all modes. At the first time, the confirmation of access to Photos is required once from iOS system when you press "Snap" button. 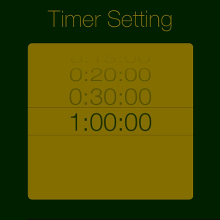 Timer time can be selected from a minimum of 1 minute to a maximum of 1 hours. 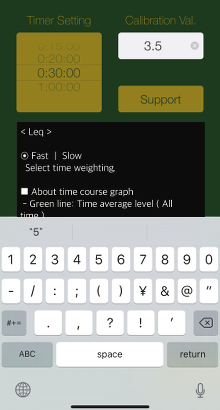 By tapping "Close" button, it will move to the previous measurement view. By tapping "Set/Info" button, it is displayed the product information and function description. If you tap "Support" button, Safari starts and you can see our support page. By tapping "Close" button, it will return to the previous measurement view. Please send a review message for "Sound Level Analyzer".